Designed for low maintenance and smart operation, the Vicks V4500 Filter Free Humidifier takes the truly takes the headache out of humidifying your space. This 1-gallon cool mist humidifier uses no messy (or costly) replacement filters and features an onboard humidistat that maintains your desired humidity automatically. It's never been easier to enjoy the soothing relief of cool moisture. 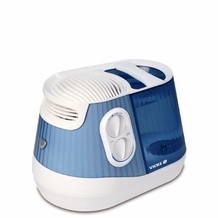 The Vicks V4500 Humidifier adds 1 gallons of comfortable moisture to cover medium-sized spaces up to 360 square feet. Place it on a tabletop, countertop, or nightstand for continuous relief from dry wintry air. The Vicks V4500 Humidifier also makes maintaining your desired level of humidity hassle-free. It features a smart automatic humidistat that maintains your humidity setting automatically. Simply set your desired humidity level with the humidistat switch. Once the set level is reached, the humidifier will shut off and the green "desired humidity" light will illuminate. The humidifier will then cycle on and off to maintain your humidity and ensure your space remains comfortable. Runs 18 to 24 Hours - This humidifier has a long runtime of 18 to 24 hours on a single fill. Ultra-Quiet Operation - Ultrasonic humidifiers don't use noisy internal fans to distribute mist. Operation is whisper-quiet and perfect for the overnight hours. Translucent Tank - Monitor the water level through the blue translucent tank. Visible Moisture - Visible cool mist floats up through the top of the humidifier, so you know the humidifier is working. 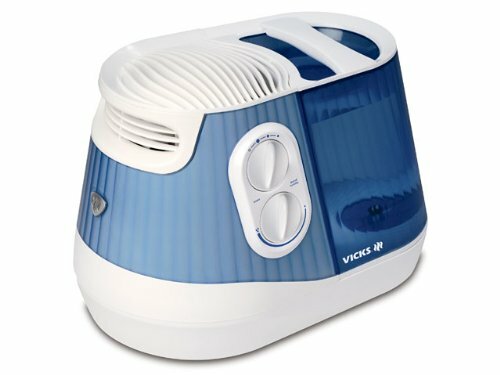 Integrated Scent Pad Heater - Use the Vicks V4500 with Vicks Scent Pads to enhance mist output. One complimentary scent pad is included with your humidifier. Coverage Area	200 sq. ft.